While we do not condone smoking as it is by far one of the most damaging vices one can have, we have to be honest and say that some ashtrays are made to impress. That’s the case with those constructed of glass, many of which can either have a classic design or a retro one such as some of the models we’ve showcased below. Whether you smoke or not, we thought you might enjoy the following selection as it is packed with neat-looking ashtrays that you could at least use for storing your small-sized items such as earrings and various trinkets you might have lying around on your desk. 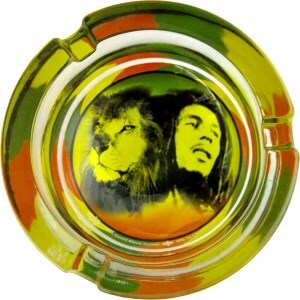 The Bob Marley & Lion of Judah Rasta Colors Glass Ashtray is a good item to have in your home if you’re a smoker. Whether you’re passionate about reggae music or not, its vivid colors bring a certain playfulness to your home. The ashtray measures 3.25″ x 1.5″, which recommends it for everyday use, even if you’ve got people visiting. The item is durable and easy to use. Its thick glass is recommended against breakage and for prolonged use. Plus, the design makes it really simple for three smokers to use the ashtray at the same time. The Gracave Crystal Cigarette Ashtray Home Office Tabletop Beautiful Decoration is a crystal model for people who are invested in making their homes a feast for the eyes. 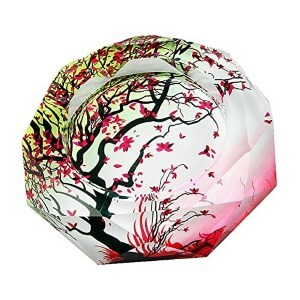 The ashtray has a delicate design, with a Japanese look given by the cherry blossoms. 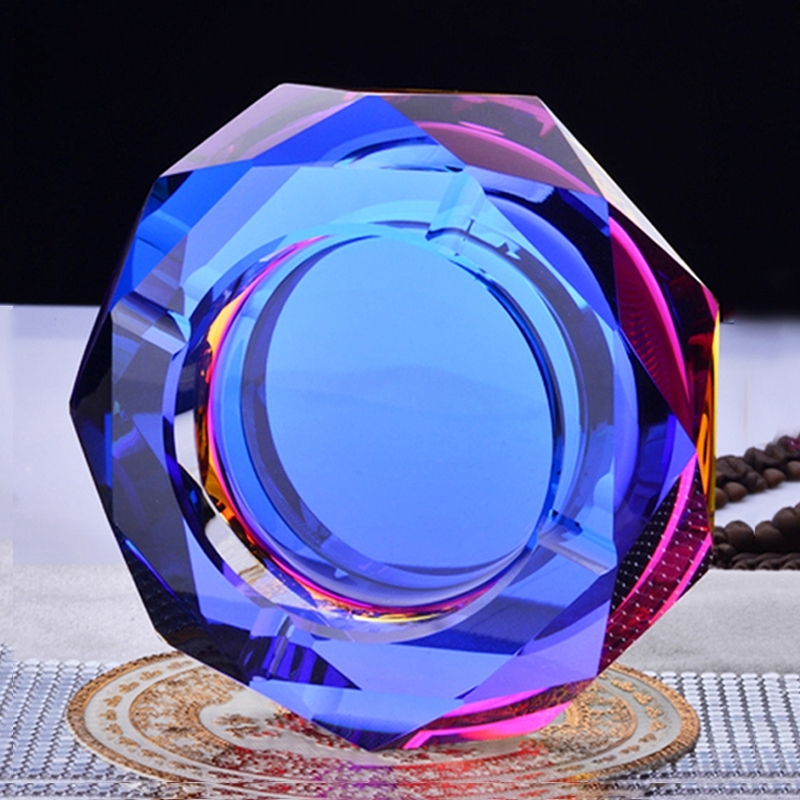 The crystal is artificial, not a mineral crystal, but the item makes a perfect gift if you’re looking for a nice decorative object, and it comes already packed in a gift box, to make your job easier. The item is suitable for living room use, and it can easily accommodate more than one smoker at a time. This spinning tray is an efficient item for people who have the tendency to smoke regularly. Its capacity to spin and move the ash inside a covered vessel allows you to have as many cigarettes without that nasty after smell. The issue with most of the ashtray models is that the cigarettes remain uncovered after you’ve smoked them, which causes the unpleasant smell to go into all the fabrics. The item has a glass container that comes in different bright colors that you can easily match to the inside of your home. Unlike other choices out there, this is a model that can easily go with any kind of interior decorations you may have at home, due to the vintage pin-up design. The model on the bottom of the item is stylish enough so it would not create the impression of cheap taste. Since vintage motifs have returned, having this type of decoration is modern and stylish. The product can make a very nice present in case you’re considering purchasing to make a nice gift. The glass is thick, and the model is printed on the inside of the glass, so it won’t wash away in time. 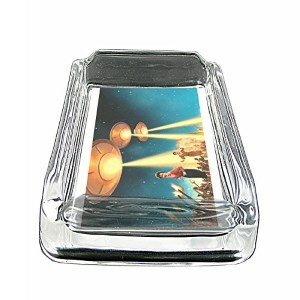 This particular ashtray is a consumer favorite among people who like fantasy and Sci-Fi, and it makes a perfect gift for literature and space aficionados. The item has a vintage look that goes easily with any kind of interior design, so matching it with the home ensemble shouldn’t be a problem. The product’s bottom has a velvet backing that can be removed easily for the purpose of cleaning the item smoothly and avoid any leftover traces of ash or unpleasant smell. The item’s dimension is approximately 4” x 3”, which recommends it for everyday use. It’s no wonder that this option is a recommended gift and decorative object for people who are passionate about airplanes and aircraft. The product’s dimensions are approximately 4” x 3”, which makes it suitable for everyday use – the item does not take much space, and it brings a certain vintage look that can be easily matched with any kind of interior. The image shows a vintage helicopter model high in the sky, which makes for a nice gift even for people who aren’t necessarily passionate about aircraft. The image is a skin attached to the velvet packing, and it will not get damaged in time. When it comes to ashtrays, It doesn’t really matter if you’re a smoker or not. Some people manifest a distinct attraction for this sort of home object without smoking a day in their life. You could use it and fill it with cigarette buts or simply display it as home decor. Finding an ashtray is the easy part, of course. 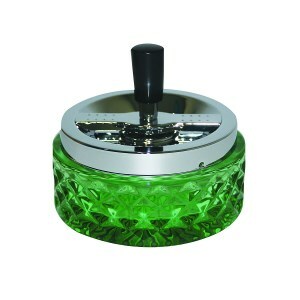 The difficult part is discovering a glass ashtray that would impress your friends whenever they come to visit. Simple, bulky ashtrays made out of glass, metal or ceramic and wearing the brand of a tobacco company are everywhere, and standard models with no distinct features are cheap and easy to find. 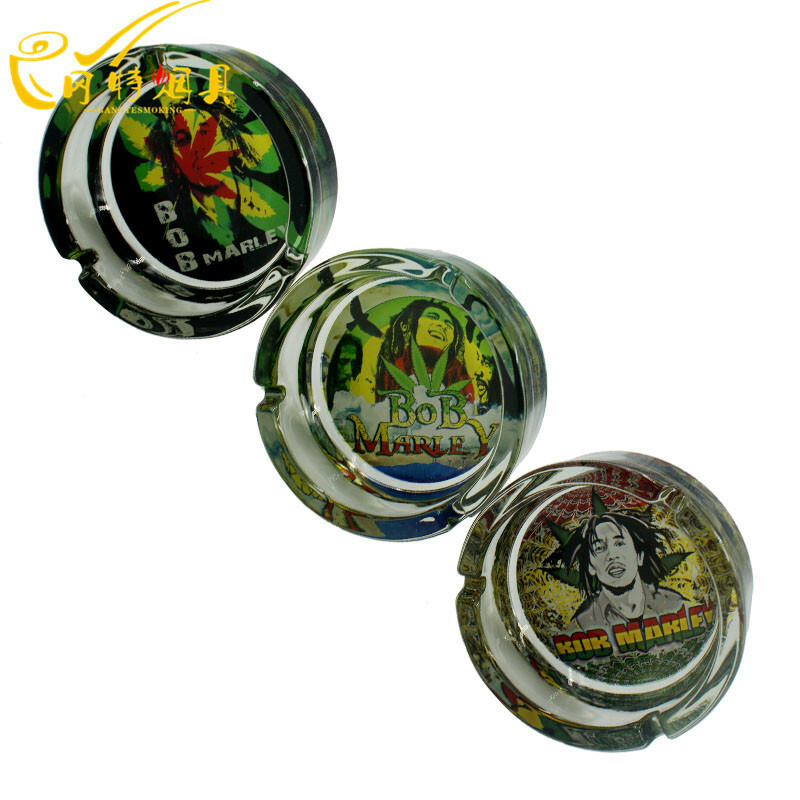 But cool glass ashtrays that you might be looking for are harder to identify. Since the quality and design features that you are in search of are obscured by a large number of uninteresting products, you are about to invest precious time in bringing them to the surface. We can save you from this dull effort by providing you with a comprehensive guide. We have managed to research the subject you’re so interested in and we will offer you a helping hand in the lines below. As we had to find a common object with a less obvious aesthetic value, we had to dissect the main characteristics of the product and find out precisely what was it that we had to look for. This is what we consider useful. Most of the ashtrays you can now find on the market are contemporary or modern. The modern ones, of course, have greater value as they have now become vintage collectibles. The style that has been used to manufacture them is no longer in use and the artists or glazier artisans have ceased to create. Pieces that date back to the first half of the 20th century or even back to the beginning of the same century are antique objects that were mostly created following the Edwardian or Art Nouveau styles. But only few glass ashtrays remain. Others were made out of different materials, including crystals and gemstones. You could consider them unique models, but they are not always as glamorous as you would expect. The beauty and value of such objects also depend on their condition and your artistic preferences. From the mid 20th century to contemporary productions, some people think there is an improvement in style, as the home decor function of ashtrays is always in focus. While most ashtrays were industrially made for a common use, artists have found ways to express themselves using this simple and piece of home interior. People that designed ashtrays were perpetually looking for new forms to disguise its use or give it more of a decorative value. That is why glass ashtrays have various shapes and colors, going from perfectly geometric squares and circles to very uncommon asymmetric designs with grooves and waves. Triangles and spheres were also attempted and you can still find this kind of design, not always made of simple glass, though. Producers have also used different volumes and weight for the items. Some of the ashtrays have a massive glass composition, while others only a thin shell. 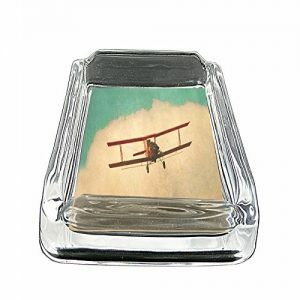 Some favored small glass ashtrays, and others big ones, where cigars can sit undisturbed. The more complex types of ashtrays used to have two or three pieces. Some used to have a metal or glass pedestal, others were built with a removable top cover, and other kinds boasted a pedestal and cover at the same time. 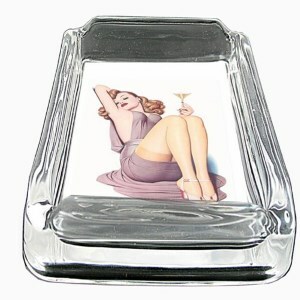 The popular trend has created an increased appetite for ashtrays with a dark sense of humor. A glass skull ashtray became a memento in many kitchens. Other items only had the skull design visible on the bottom. Having sculptured ashtrays in the kitchen or guest room appeals to some homeowners. A groovy, rococo looking ashtray is less practical for smokers, but it has an artistic vibe some people approve of. At the same time, the round, square or rectangular ashtrays are attractive thanks to the way light is reflected by their sharp or curved angles. The common, well-known type, are clear glass ashtrays, while those used in public places often utilize strong, dark-colored glass. But some producers use a higher quality crystal (such as Bohemian glass) or colored glass with bright hues and silver or gold in the composition. These are artisan glass-types that have great features. The light reflected by this kind of glass has a different, velvety shine and solid colors have great intensity. You can find these finesse features in Venetian glass ashtrays as well as in the Murano glass ashtrays for sale. The variety of techniques and ideas implemented by the master craftsmen is noticeable in glass objects that incorporate air bubbles or use mineral oxides to render tinctures that are hard to capture. Some of the glass is ‘improved’ by adding a silver plate or traces of precious metal on the surface. But because not all manufacturers can apply this method, like Italian artisans, some use bronze or silver frames once the glass is already cut, adding value. The way the products are obtained is one of the most important details when you’re looking for a beautiful home decor. Usual ashtrays are most often machine cut, while those made by artisans are hand blown and need no retouching. Artisans use their own ovens and make their own composition in order to make the glass pieces. Using the power of their lungs and special pliers, they shape the glass on the spot, so the creative process is instantaneous and uninterrupted. However, not only hand blown glass looks great. Other cut-glass ashtrays are impressive because the high-quality crystal receives successive cuts that are made by hand. This way, the purity of glass and the filtered light create a bright effect that captures one’s imagination. The cuts need to be perfect, otherwise, the quality of the finish is compromised. Glass quality, style, shape, and production method need to be combined so that the result is satisfying for even the most highbrow purchaser.